Give your business the efficiency it deserves with a Canon imageCLASS printer offering feature-rich capabilities in a high quality, reliable copier and scanner that is ideal for any office environment. Your professional quality documents are printed at speeds of up to 28 pages per minute in black and white. A laser all-in-one printer will save you time, paper, and related costs over traditional inkjet all-in-one printers. This all-one-printer ships with support for PCL 5e/6 (similar to postscript) enabling printing support from near any operating system, distribution, or release via using a standard driver. This model can be hooked up to one or many computers with support for 802.11 wireless technology, and a physical ethernet port, or a single computer using a USB cable. 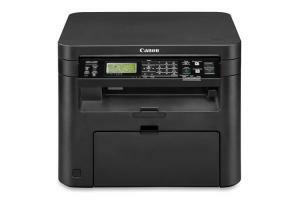 Unlike most all-in-one laser printers on the market this Canon imageCLASS printer doesn't depend on proprietary and problematic drivers or OS-loaded firmware components. For scanning a back end sane-pixma driver component is utilized. This is a clone of the original Canon driver protocol, but with a complete set of source code available for optimal integration and support by your favorite GNU/Linux distribution. This is a production ready driver which will be shipped in future releases of your favorite distribution for a seamless works out-of-the box experience. In the mean time we have support and documentation for manually installing the print and scanning drivers on many popular distributions. This model will eventually have support for all core functionality (printing, scanning, and copying) out-of-the-box across most if not all distributions. Currently however not all recently released distributions do. Most popular and recently released distributions though will have support currently for at least printing out-of-the-box (although a manual driver selection may be required depending on the distribution and release). For some of the most popular distributions listed above we have detailed directions on our web site for how to manually install the sane-pixma driver. This will enable support for scanning using the printer. There are also directions for starting the add printer wizard to add the printer such that you can print with it as well. If you have any questions about your favorite distribution and support contact us with the name of your distribution, version of the distribution, and product you are looking to buy. Notes: Includes toner cartridges (starter), power cable, and all-in-one printer. USB and ethernet cables sold separately. Europe, Canada, South America, Africa, Asia, Mexico, Russia, Greenland, Iceland, New Zealand, Japan, India, Pakistan, Iran, the Pacific Islands, any other islands, and the middle east. If your printer breaks you'll be glad you picked up a warranty. Our service plans include free telephone support and a replacement if your printer takes an early retirement.